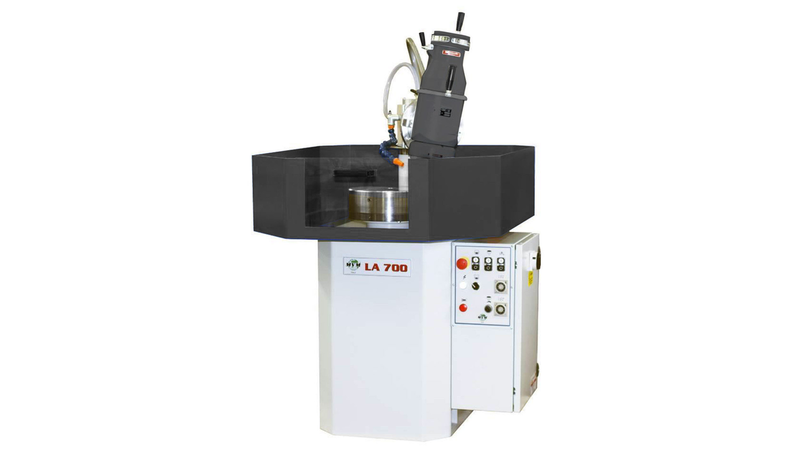 LA500-700 is an easy to use grinding machine, that is very versatile and unique. It combines three characteristics that enable it to grind beveled circular blades up to Ø500mm, other work-pieces and meat mincing cutters: 0°-70° rotating head, automatic working cycle, and variable speed of the rotary table. The LA500 has a very sturdy and rigid base, this combined with excellent weight distribution ensures the LA500 operates without vibration and therefore produces a high quality finish. The LA500 is equipped with an electric grinding motor with power either 2.2 or 3.7 kW (3 or 5 HP), rotation of the grinding head from 0 ° to 70 °, Ø150mm cup wheel, programmable automatic working cycle with down-feed of the grinding wheel, reversal the rotation of the grinding wheel, and variable speed of the rotating table (3/35 rpm). It can also be equipped with a magnetic chuck Ø 300-350-400 mm, magnetic cleaner or paper filter with external coolant tank, PLC with automatic working cycle including spark-out timer and retraction of the grinding wheel at the end of the cycle (version LA500NC), variable speed grinding wheel 3000 -6000 rpm,protection cabin with extraction system, adjustable column for grinding of work-pieces of a height up to 310 mm. Also available is the version LA700 for grinding circular blades and discs with diameter up to 700 mm and the version LA700/90 for grinding disks at 90°.